All road races are bunch races. You’ll start off in a group and unless you’re sufficiently strong to ride off the front on your own, you’ll spend the majority of the race surrounded by other riders with your wheel only inches from the one in front. Unlike time trials, where the strongest rider generally wins, road racing is as much about tactics as fitness: you need to be able to read the race, spot the breaks that matter, get into them, and attack when the time comes. You’ll race over a set number of laps on circuits of around 10 miles. Circuits vary in difficulty depending on the number and steepness of the climbs. As a male beginner, you will normally race over 30 to 60 miles in a bunch of around 30 with others of similar age and/or ability (this doesn’t really apply to women’s races, as we explain in our ‘Women’s road racing’ section below). Since roads remain open to the public, there’ll be a lead car in front of the race, and a car or (more usually) a motorbike behind the main bunch. There will be marshals at junctions and danger spots, but they are there just to warn riders, drivers, pedestrians and spectators, not to stop oncoming traffic. You must follow the rules of the road at all times, such as keeping to the left of central markings and never crossing solid white lines. There are also races, known as criteriums or ‘crits’, on closed circuits of usually around 1 km. 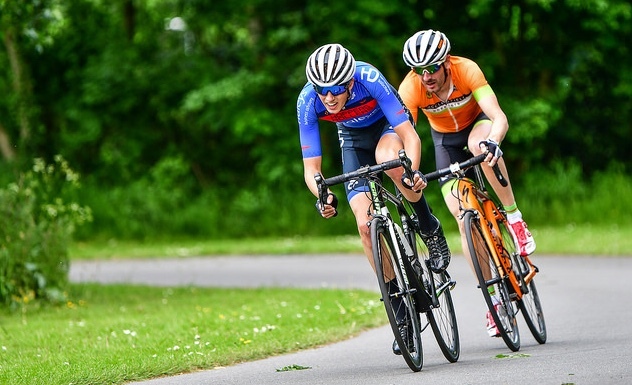 Crits are generally run over a set time of 40-60 minutes and have the advantage that you’re not worrying about oncoming traffic or road junctions. Crits are a good place to start racing as there’s less to worry about and they’re shorter than races on the open road. because the races are shorter, they’ll generally be faster. Crits will suit you if you’re more of a sprinter and they’re great for women wanting to start racing as the fields are smaller and you’ll find separate women's races at a lot of circuits. Our closest circuits are Tameside, Oulton Park, Darley Moor and Swynnerton Army Camp. These host plenty of races at the weekends and on mid-week evenings between March and September, for example every Tuesday evening at Tameside. You never know until you try! As a general rule, if you can ride on your own for 30 to 40 miles at an average of 18 to 19 mph, you’re fit enough to give racing a go. It’s best to do some club training rides first to test and build your strength and give you a feel of how to ride close to other riders at speed and go ‘through and off’ (take short turns at the front). British Cycling’s video series on the ‘dos and don’ts’ of road racing is also very useful. Then, the only way to know how you’ll get on with racing is to give it a go. In a race you don’t have to take a turn, so if you are suffering just sit on. Don’t be discouraged if you find the speed very high in your first few races or get dropped by the bunch. Every rider has been dropped at some point and there’s no shame in it. Just a standard (roadworthy) road bike is absolutely fine. You can now race with disc brakes too if your bike has those. You will see some pretty fancy kit at races but it’s the legs not the bike that matter. You’ll just need shorts and a jersey, no more. If you’re racing for an hour, as is common at criterium races, you may want one bottle on your bike. You can’t have triathlon/TT bars attached (or use disc wheels) and you should remove lights, pump holders, etc. You have to wear a helmet. Helmets deteriorate over time so you should look to replace yours approximately every three to four years. If you’re under 40, you can join both BC and TLI Cycling. If you’re 40+, you’re classified as a veteran and can join both of these and the LVRC. Both TLI and LVRC events are based on competitors’ ages, whereas BC races are based on ability, so you will find many more older riders in TLI and LVRC events. If you have never raced before, you will be a 4th category rider on your BC race licence. You gain points from race results, varying from points for the top 3 riders only if there are 10 or fewer in the race to the top 10 or 20 if numbers are larger. As you gain points you will move up to 3rd, 2nd, 1st cat and the top level is Elite. Details of races (dates, location, length and difficulty) are published online and (less frequently these days) in handbooks sent to members. All three organisations allow you to enter a race on the day, but it’s much better to enter in advance rather than get there and find that your race sold out months ago. Neither TLI or LVRC have traditionally organised women-only events, but this year LVRC will be trialing their first women’s only race. Women who wish to enter regular TLI or LVRC races can do so and are normally placed into an older men’s age group so all the women have an equal chance to compete. Only a small number of women tend to compete in TLI and LVRC races. either hold a BC Full Racing Licence, or buy a day licence. If you join BC as a Silver or Gold member, you can buy a Full Racing Licence. This will allow you to enter regional, national and international events at which you can compete for points to move up the categories from 4th through 3rd, 2nd and 1st to Elite standard. TLI Cycling organises age-related road races and is particularly active in the North West. Most Wheelers who road race do so with TLI Cycling. Membership of TLI includes your racing licence. TLI races are an ideal way to start road racing, or get back into it, as competitors are split into different races by age (in five-year bands). There are generally prizes for each individual age category so everyone has something to race for. You don’t have to race in your own age group. For example, if you are 40+ but feel you’re not up to the standard of that age group, you can ride in a 50+ or even 60+ race (although you won’t be eligible for any prizes). Women generally race two or more categories above their age. TLI membership is considerably lower cost than BC membership and if you want to try out a race, you can buy day membership for closed circuit events. There are a series of Road Race Taster Sessions being run this year at Oulton Park on 28 May, 4 June and 11 June (all Tuesdays). The League of Veteran Racing Cyclists (LVRC) is organised in a similar way to TLI Cycling but is specifically for men and women racing cyclists over 40 years old. As with TLI Cycling, your membership includes your racing licence and you don’t have to race in your own age group. Unlike TLI Cycling, you cannot buy a day licence. There are relatively few LVRC events in the North West, although the Darley Moor series is very popular. The skill sets required to race at the top level are the same for women and men, but at a local level the races do look a bit different. You still need to be able to ride close together in a group but you’ll generally see smaller fields in local women’s races, maybe 10-25 riders compared to a men’s field of 40 or more. This makes it a bit less intimidating to start with. Since men have more opportunities to race they have more opportunities to move up the licence categories. This means 3rd cat men for example are at a pretty similar level of fitness and ability. But in women’s racing there is little between national-level racing and small local races, so it’s harder to gain points to move up categories. This can mean that you have good riders who are lower categories (known as ringers!). For example, even at a smaller women’s event that seemed a good starting point for a first race last year, the field included a rider who had come 5th at the National Time Trial Championship but was only a 2nd cat rider. The ideal starting point for a new female rider is a 4th cat women’s only race. This means all the riders in the race will be new to racing. Sadly these are few and far between but here’s an example of one in Wakefield in March. Quite often 4th cat riders are put in races with 3rd and even 2nd cat riders. So you will see lots of 2/3/4 women’s races. Try picking an easy circuit such as Darley Moor or Salt Ayre to start with; these circuits are easy rolling and are easy to sit in and get a feel for things. Once a month there is a women’s specific race on a Tuesday evening at Tameside Circuit in Ashton-under-Lyne. This is a good place to start with as it’s local but the circuit is much more technical with a couple of corners that will probably split the group, so it’s not one to start with if you’re not great at cornering! Racing Chance Pimbo Road Race (road race but one-way traffic so a good first road race).